More revenue now. Faster growth in the future. A stronger position in the marketplace. How can more digital publishers seize these opportunities? In “direct” or “traditional” sales, agencies and advertisers buy an agreed-upon volume of impressions, or ad views, for an agreed-upon price directly from the publisher, and the publisher then manually sets up the delivery of these impressions. In line with the terminology used by most publishers, we refer to such transactions as “direct sales” throughout this report. But as traditional direct and programmatic channels converge, how will the industry’s definition of “direct” evolve? “Programmatic” sales use technology to automate the selling and delivery process. They can involve auctions or fixed prices. The sales model can be entirely automated, with buyer never communicating directly with seller, or buyers and sellers can have an ongoing business relationship and negotiate deals that are then executed automatically. Currently, the vast majority of programmatic sales outside of social media are bought on an impression-by-impression basis. However, many predict the further rise of programmatic guaranteed, with buyer and seller agreeing on a certain volume of impressions—much like direct sales today—but with the sale and delivery processes more automated. This will further blur the distinction between direct and programmatic sales, and a new nomenclature may become necessary. Yet new research by The Boston Consulting Group shows that many publishers are failing to capture this opportunity. One reason is that they do not approach it strategically. They treat programmatic advertising as an incremental rather than a core source of sales, and they leave increasing amounts of revenue on the table as a result. Another reason is that they do not organize themselves to realize the maximum value from their programmatic efforts. Our study found that less than 25 percent of the programmatic team’s time is spent on value-creating activities and that publishers use nowhere near the full range of technology tools that can increase programmatic sales and profit margins. This report examines similar questions on the “sell side,” in particular, why publishers are not doing more to embrace the substantial opportunity that programmatic sales represent. The report was commissioned by Google and the findings outlined herein were discussed with Google executives, but BCG is responsible for the analysis and conclusions. In our study, BCG worked with more than 25 digital publishers (which participated anonymously) spanning multiple segments (content publishers, broadcasters, e-commerce, and portals) and focusing on both broad content (such as news and entertainment) and specialist content (such as travel or technology). The study involved in-depth operational workshops to understand the details of programmatic sales and operations and where these create value. We used the lean-management method of value stream mapping to visualize and measure both sales and operations processes and conducted interviews and analyses around the key drivers of revenue. Our research also included interviews with senior decision makers and operational staff to identify best practices and key means of generating revenue. We used data analysis to quantify the latter. Our source for market size and growth rate figures was Magna Global Intelligence. Our research clearly indicates that publishers that lack an aggressive cross-channel strategy, including a strong programmatic capability, leave money on the table today and risk loss of revenue, commoditization of inventory, and lower market share in the future. On the other hand, those that position themselves to deliver value to their advertisers in the programmatic market will both increase revenues in the near term and have a significant and growing advantage over their competitors as the digital market expands and evolves. A big opportunity is getting bigger—fast. Advertisers value the ability of digital marketplaces to deliver their ads to relevant consumers, at opportune times and alongside pertinent content, much more precisely than was possible in the offline world. Programmatic buying is no longer just for desktop display; it is fast gaining traction in mobile and video. Some sell-side platforms (SSPs) report that about a quarter of all programmatic transactions now involve ads served on mobile devices. Large advertisers are already allocating significant portions of their overall budgets to programmatic. American Express, for example, has indicated an aspiration to be 100 percent programmatic within 18 months. Brand-marketing campaigns are also shifting to programmatic buying as more premium inventory becomes available and marketers gain confidence in the benefits of programmatic trading. As Procter & Gamble’s chief marketing officer put it, programmatic “creates value for the consumers, and therefore creates value for the publisher and for the advertisers/brands.” Participating in programmatic marketplaces also enables publishers to tap into new demand pools, often including advertisers that do not buy through direct sales. In its first year of programmatic sales, Condé Nast UK discovered that 60 percent of its top 50 advertisers that buy programmatically were entirely new customers. A comprehensive strategy that encompasses both direct and programmatic channels will become an imperative as sales models evolve, as programmatic continues to rise in importance, and as traditional direct sales are increasingly limited to high-end, high-touch relationships where publishers can add significant value, such as those involving creative, publisher-written “native content” or the use of complex proprietary data to optimize performance. 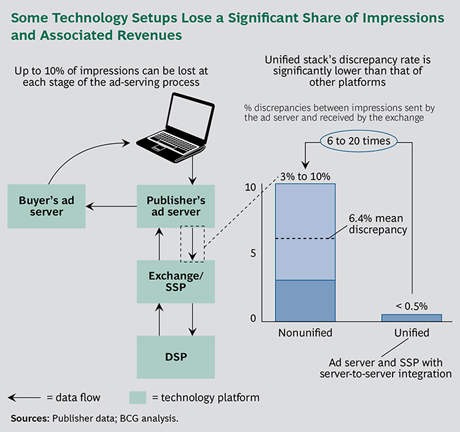 Programmatic models also extend beyond digital publishing to offline properties. Time Inc. uses programmatic sales for its print publications. Programmatic sales occur for on-demand TV services, and the advent of targeted ads via cable, satellite, and Internet TV will open traditional TV ads to programmatic sales as well. …but solutions are available. Publishers leave money on the table by not focusing more on value creation and by not using the full range of optimization techniques available. By analyzing the performance of different segments of inventory—specifically, which ones are attracting the most active bidding and by whom—publishers can optimize their auction parameters (such as floor prices) and test the impact of various offerings, configurations, and bidding criteria. This data can then be used to feed leads and new propositions to the sales teams. It can also be used to advise advertisers on their bidding strategies. All of which leads to higher yield and additional revenue. One publisher in our study makes an average of one extra sale per week, either as a direct sale or a programmatic deal, from analyzing bidding data and up-selling based on the results. Another increased CPMs by 30 percent on one ad exchange by consistently monitoring bids and adapting floor prices. Limiting the Number of Demand Partners. Generating demand from multiple sources—by using several SSPs, for example—can make publishers more susceptible to inefficiency and wasted time, as the volume of nonvalue-creating activities increases with the number of demand sources. We found that publishers using a single SSP spend an average of about 30 percent less time on ongoing processes than those that use two or more. Putting in Place Quality Assurance Measures. Publishers can implement procedures to preempt problems that require troubleshooting later, such as prescreening of key information from a buyer and its demand-side platform (DSP). Some major SSPs include functionality that enables a publisher to review the ads on its site that are purchased programmatically; an hour or two a week spent checking for, and blocking, unwanted ads can save many more hours of “fire fighting” problematic ads as they appear. Automating and Standardizing Reporting and Billing Processes Wherever Possible. Smart publishers use readily available technology to reduce the amount of staff time—and the associated costs—spent on low-value, everyday activities. The time these steps save can be used to create compelling sales offers and to optimize performance through research and data analysis, ultimately driving more revenue. Despite the growing pains, there is a new model emerging that enables publishers to better capture the programmatic opportunity and use both direct and programmatic strategies to boost sales and margins. Our workshops and interviews highlighted four key practices. While many publishers pursue some of them to some extent, only three companies in our study (12 percent) fully embrace them all. The ones that do outperform the market. Apply a cross-channel, data-driven strategy. As publishers look to rationalize traditional direct and programmatic sales, pricing structure and go-to-market strategies are key considerations. Forward-looking companies take a data-driven approach across both direct and programmatic channels. They do not get hung up on out-of-date distinctions; instead, they probe advertiser and user data to develop a clear view of the propositions that sell best in each channel, which then shapes both their sales and their pricing approaches. For these companies, programmatic is no longer just a way to sell remnant inventory—it has become a key tool for the same types of inventory that are sold directly, especially in more mature markets. “We [price] programmatic at least the same as direct,” said a senior vice president of a major US news publisher. “It’s the same inventory so it should have the same value, and this avoids any channel conflict. I don’t have remnant inventory anymore; instead, I just have inventory that I sell via different channels and models. We have seen both our revenue and CPMs grow, and our programmatic approach has been key to that.” A similar trend is at work, albeit more slowly, in less mature markets. The programmatic marketplace is set to accelerate as sales of programmatic-guaranteed inventory become more significant. To maximize revenue today and avoid cannibalization and price erosion in the future, publishers need to comprehensively think through pricing structure and go-to-market approaches across their direct and programmatic strategies, including their guaranteed and nonguaranteed models. One North American broadcaster aims to completely replace traditional direct sales with programmatic guaranteed within the next two years and is already working through the pricing and organization ramifications of the move. As channels converge, the right direct and programmatic strategies will differ by market and publisher. For example, publishers soliciting direct-response marketers require a robust programmatic capability that appeals to the aggressive approach of these advertisers. At the same time, premium websites seeking to attract high-end brand-marketing campaigns need to carefully consider how they price and expose inventory to maintain their premium status and prices. In some markets, large publishers can leverage their scale to lead the market in a direction that aligns with their strategy. In February 2015, eBay UK held a “programmatic-only week,” offering its entire inventory for sale exclusively on a programmatic basis. In addition to raising awareness of the advantages of programmatic trading, this initiative enabled the company to better understand the current role and requirements of programmatic buying, and it has since reorganized its sales teams to reflect what it learned. High-value targeting is typically offered to buyers through invitation-only auctions or through unreserved fixed-rate, or “preferred,” deals, in which buyer and publisher agree on a set price for a certain type of inventory. These impressions are generally sold at premium rates, reflecting their added value. This approach is rapidly growing in popularity. In Google’s ad exchange in Europe, the Middle East, and Africa, for example, unreserved fixed-rate programmatic transactions quadrupled last year and invitation-only auction transactions doubled. Best-in-class publishers go a step further and identify which segments work best for different advertisers. Some use special-event-based offers that help keep their media properties front of mind for buyers. Half the participants in our study regularly initiate private deals, while the rest do so only on an ad hoc basis, typically in response to an advertiser’s request. One European online publisher realizes premiums of about 40 percent for contextual advertisements, 65 percent for first-look packages, and up to 220 percent for first-party data. A UK news publisher that uses customized programmatic sales of inventory targeting its highest-value audience segments achieves CPMs up to six times those for direct sales. In a fast-evolving market, it is also important for publishers to stay close to buyers in order to anticipate their changing needs. For sales teams, this means keeping track of buyer preferences with respect to budgets, access, and relationships with trading desks. In the US, for example, trading desks at major buyers increasingly want “always on,” invitation-only deals with access to all of a publisher’s available inventory. Publishers that provide this access see higher revenue; those that don’t, struggle. Assemble the right technology. Publishers must navigate a complex technology landscape. Assembling the right layered collection of software—or “stack”—is critical to revenue generation, since it is the stack that helps publishers maximize revenue by providing essential inventory management and process controls, as well as the gateway to advertiser demand. Complicating matters further, publishers must make these decisions across multiple formats and platforms, including desktop, mobile, display, and video. While many ad servers, and the more sophisticated SSPs, work across formats and platforms, enabling publishers to remove some complexity and gain an integrated view across their inventory, this is not universally the case. To avoid getting lost in complexity, publishers need to think strategically about their technology stacks—the layers of software that make up the ad-serving ecosystem. Many publishers elect to use a primary SSP from which they access and manage most, if not all, of their real-time bidding demand, since all the major SSPs provide a large pool of demand. While there is considerable debate about the amount of additional unique demand that can be tapped by accessing multiple SSPs, some publishers believe that it increases yield and that the additional revenue generated more than offsets the disadvantages of a more complex stack. Even when impressions aren’t lost, data associated with them can be, reducing the value of the impression to buyers. In addition, a unified stack can prioritize demand based on live bids, which allows for real-time decisions about how to maximize revenue from each impression. Publishers that use multiple programmatic demand sources recognize that there is substantial overlap of demand among the major SSPs, but they believe they can leverage buyer behavior and the way they configure platforms to generate higher prices and increased revenue. One technique is to compare bids for a given impression, either live or based on past performance, in order to sell the impression via the highest-bidding demand source; however, this requires the stack to have the relevant functionality and “decisioning” capability. Another method is to send an impression to different SSPs sequentially (or to the same SSP multiple times), starting with a high floor price and dropping the price as the prospective sale moves through subsequent SSPs. Publishers use this tactic because programmatic auctions are so-called second-price auctions, meaning that while the highest bidder wins, it actually pays either the second-highest bid price or the floor price, whichever is higher. Publishers can attempt to capture incremental revenue by minimizing the spread between advertiser bid price and auction close price. There is no single answer to what constitutes the right technology stack and configuration: each publisher has its own needs, strategies, capabilities, and supply-and-demand dynamics. In our study, around a third of publishers used a single programmatic demand source and half used two or three sources. We found many examples of publishers that were successful at increasing revenue with either strategy. However, those that used multiple SSPs successfully were careful to assess the impact of new sources and configurations. They also carefully consider potential downsides, such as fragmenting demand and the technology and process inefficiencies associated with using multiple SSPs. As the line between direct and programmatic approaches continues to blur, technology strategy will play a crucial role in determining the best channel for different kinds of inventory. We expect the use of solutions such as enhanced dynamic allocation (EDA), which is offered by Google’s DoubleClick, to proliferate. EDA optimizes deals across guaranteed and nonguaranteed impressions, allowing publishers to maximize revenue while ensuring that guaranteed impressions are delivered. In our study, publishers using EDA achieved an increase in programmatic revenue of as much as 24 percent and an average increase of 12 percent. Build strong go-to-market and analytic capabilities. Capabilities matter—and forward-thinking publishers are already developing their teams, especially in such critical programmatic functions as proposition development and pricing, sales, and analytic yield management. Half the publishers in our study have already strengthened their programmatic teams—or plan to do so in the next year—by hiring programmatic sales specialists and data scientists. Publishers are integrating standalone programmatic teams with traditional sales teams and increasingly expect all team members to understand and make programmatic deals (although only 4 of the 25 publishers in our study have fully integrated their traditional and programmatic sales teams to date, and even those with integrated teams have one or two programmatic specialists who support more complex sales). Publishers that leverage their traditional sales relationships typically generate more programmatic sales from core clients while avoiding problems with channel conflict. Over time, high-performing teams will rely more and more on a consultative approach, supported by data analysis, with deep knowledge of different buyers’ needs, including optimal targeting and an understanding of when different sales channels and models are most appropriate. At all points in the go-to-market process, publishers need to leverage data and technology that can help optimize ad exchange setup, analyze performance, provide insights into which segments are valuable to which advertisers, maximize yield, and ultimately increase revenues as well as improve efficiency. Best-in-class publishers develop sophisticated analytical capabilities in order to deliver continuous optimization and measurable revenue improvements using methods such as multivariate and A/B testing. One big US publisher hires finance-sector analysts for their quantitative skills in yield optimization, and the company runs between five and ten A/B tests at any one time. While digital markets today vary in maturity, there is no doubt that programmatic deals are central to the future of digital advertising globally as well as across formats and platforms—display, video, desktop, and mobile—and that programmatic and direct channels will become less clearly delineated over time. Publishers need to ensure that they are set up for programmatic success today and tomorrow by reassessing their strategy, sales proposition, pricing, technology, capabilities, and organization—across both traditional direct and programmatic channels. They will benefit immediately from more productive and more efficient programmatic operations and in the future from a stronger market position. Publishers already embracing our four recommendations are outperforming by increasing market share (both programmatic and direct), overall CPMs, and total revenue. More important, they are positioning themselves for explosive growth in the programmatic market over the next few years, when billions of dollars of revenue and market share will come up for grabs. The authors are grateful to Andrew Browning and Salvatore Cali for their assistance in the preparation of this report. They also thank David Duffy for his help with writing and Katherine Andrews, Gary Callahan, Kim Friedman, Abby Garland, Gina Goldstein, Amanda Provost, and Sara Strassenreiter for editing, production, design, and distribution.